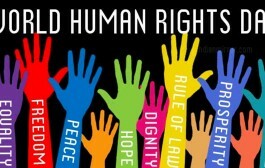 Today is International Human Rights Day, which marks the anniversary of the adoption of the Universal Declaration of Human Rights on December 10, 1948. Crafted in the shadow of the horrors of the Holocaust and World War II, the Declaration gave the world the vision it needed to stand up to fear and the blueprint it craved to build a safer and more just world. It is a bold document, based on a single premise – that the “recognition of the inherent dignity and of the equal and inalienable rights of all members of the human family is the foundation of freedom, justice and peace in the world.” Eleanor Roosevelt, who led the drafting and adoption of the Declaration, understood that we are all members of the human family, and that for governments to prosper and wars to cease, we must treat each other with the same respect and candor that we treat our own families. She knew this would not be easy or popular and that she would be accused of championing ideals that could never be achieved. But she persisted; knowing that without ideals, politics and policy are merely power games without a soul. Sometimes she did it by creating departments like the Global Office of Women’s Issues or elevating the State Department’s human rights office. Other times she did it in hundreds of quiet meetings with human rights activists and dozens of town hall meetings she held in communities from Argentina to Pakistan to South Korea. These conversations were not easy. Some leaders feared for their lives, others for their families, and others challenged Hillary to do more than she could possibly do. But she did not shy away from them. Indeed, she sought them out – even when she could do no more than lend the power of her position and her stature to their defense. But three examples stand out. In 2011, Ugandan thugs killed David Kato, a gay rights activist, and the Ugandan minister of ethics and integrity announced that “homosexuals can forget about human rights.” Rather than just mourn David and issue a formal rebuke, Hillary decided to confront, head on, the targeting of LGBT people sweeping Kenya, Nigeria, Uganda, Iran, and Russia. In 2012, in the middle of our nation’s most intense economic negotiations with China, Hillary had an unexpected, stark choice to make. One of China’s most famous dissidents, the blind Chinese human rights activist Chen Guangcheng, had made a daring midnight escape from the guards surrounding his home, to seek sanctuary in the U.S. Mission. He did not know if he wanted to leave China and he had broken his foot during his flight. He called the Beijing Mission, which then called Hillary in the middle of the night. Hillary had worked hard to develop candid and productive relationships with the Chinese ministers so she knew how the Chinese would react and the damage the news of Chen’s escape could do to the summit. But she wanted to help Chen. She instructed embassy staff to find him, bring him in, and give him medical care. The Chinese were shocked, but Hillary kept them at the table, the summit continued, and Chen enrolled in a New York law school. His family came with him. We can do better. That’s what human rights mean. ALLIDA BLACK, Ph.D., is the chair of Ready for Hillary and an Eleanor Roosevelt historian. She is a research professor of history and international affairs at the George Washington University in Washington, D.C.
Posted on December 10, 2014, in Uncategorized and tagged Eleanor Roosevelt, Hillary Clinton, Human Rights, International Human Rights Day, United Nations Human Rights Council, Universal Declaration of Human Rights. Bookmark the permalink. Leave a comment.